SEE NEW POLICY HERE AS OF 11/20/2014 - SAD DAY!! Here is how it works. You add items from amazon in your amazon shopping cart and pull it up on your amazon app that you have downloaded to your smart phone either android or apple. You tell the cashier, I have some price match item before they start ringing them up. Show them each item. & the price in your shopping cart. The items have to be same size, color, variation & brand. Where you will get freebies & money makers is from the stipulation in the policy FAQ's that walmart sent out to its stores. "You dont have to pay shipping price or fee associated with item, just the price." THIS IS HUGE!! As you know many times items on amazon will be listed for $.01 - $1.00 when the retail price is $5.00 - $15.00 or more because they charge you an arm and a leg in shipping & handling to make up for it. Most of the retailers that do this are considered THIRD PARTY. Right now walmart has not put in their policy that they wont match third party amazon sellers, so now is the time to enjoy this wonderful strategy while it is available for the masses to use! Below is links to the COUPON POLICY, PRICE MATCH POLICY, ONLINE PRICE MATCH POLICY & a scan of the STORE ISSUED FAQ's for PRICE MATCHING. Enjoy, & Happy Savings. Please let us know about your successes & challenges with this policy strategy & we will be posting videos on our hauls of these deals. Q: How does a cashier complete “Online Price Match” Overrides at the register? A: Complete the “Price Override” using action code #2, the same as in-store Ad Match. Q: Is the customer required to show the online price they are matching? A: No, it is the customer’s responsibility to state the online retailer and the online retailer’s price and then it will be the stores responsibility to validate the price difference if it is more than $50 or if the price is seems unrealistic. Q: Does the store need to validate all Online Price Matches? Q: Does the item have to be instock at the online retailer? Q: Do we limit the quantity of an item? A: Where applicable, Walmart will limit quantities to typical retail purchase quantities or one-per- customer or household to exclude dealers and resellers. The store manager has the final approval. Q: How does a cashier validate the “Online Price Match”? A: The cashier can approve an online price difference of up to $20 without validation. The CSM can approve an online price difference between $20 and $50 and is encouraged to validate the price on the MC55 or at the Service Desk when the price difference is more than $50. Q: Which online retailers do we price match? be able to access to validate the online price match on the MC55 or at the Service Desk. Q: Do we honor online retailers that aren’t listed above? A: Yes, however the Store Manager has the final approval on any “Online Price Match”. Q: Do we offer “rain checks” if the items are not instock? A: No, we do not offer rain checks if we are not instock on the identical item. Q: Do we offer a “substitution” if the items are not instock? A: No, we do not offer a substitution if we are not instock on the identical item. Q: Are Online Price Matched items eligible for associate discounts? A: No, like other price overrides, online price matched items are not eligible for associate discounts. A: No, it is the price of the item only. Q: Will site to store/pick up today honor online prices? A: Yes, if the customer finds a lower price for the identical item (size, flavor, brand, color, quantity, etc.) on a competitor’s site, we will match the price of the online item. Stores can give the customer the difference on a gift card. If you find a lower price for a Walmart.com item on another online retailer’s site, will Walmart.com match it? Walmart.com before your purchase and one of the Customer Care Agent will provide assistance with a price adjustment. The Customer Care Agent has the final decision for matching an online price. lower price for the Walmart.com item on another online retailer’s site, will Walmart match it? A. Call 1-(800)966-6546 and one of our Customer Care Agents will provide assistance. Q. Does Walmart match online 3rd Party or Marketplace sellers? A. Yes. We will match 3rd Party and Marketplace pricing but will limit quantities to normal retail purchases or one per customer or household. The Store Manager has the final decision for matching an online price. pricing, for example, $0.01 items for sale on 3rd Party or Marketplace retailer sites? A. The customer should contact a Walmart.com Customer Care Agent whom can assist. However, Walmart.com does not match prices on behalf of Walmart.com Marketplace Retailers to other online competitors. For example, an item sold on Walmart.com by a marketplace retailer is not eligible for price matching. Q. Can online price match items be placed on layaway? A. These items can be placed on layaway if the item meets the layaway criteria. Q: Are there any areas of the store that are not participating in online price match? A: Yes, there are certain areas of the store that will not match online prices. This includes, TLE, Vision Center and Pharmacy. Q: Do we match Sam’s Club or Costco or Auction Sites? 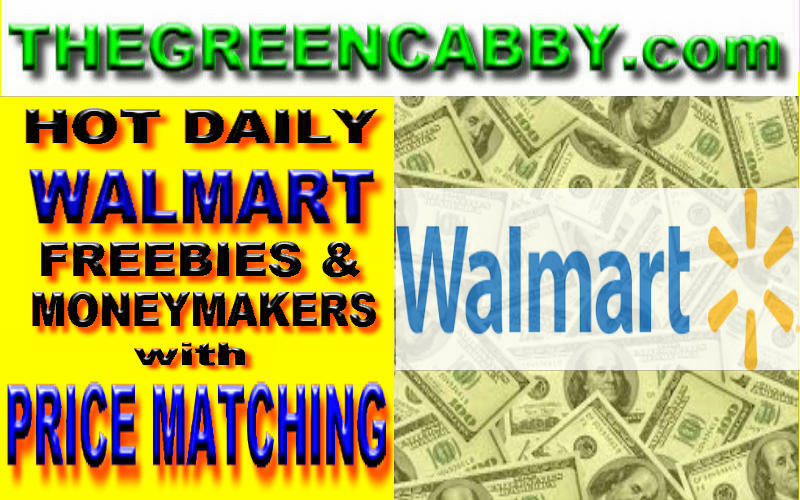 A: Walmart does not match any Membership clubs and Auction sites (e.g. Ebay). won’t load or is slow? a different device. Contact a member of management for guidance to match the online price. Q: Are 1-Hour Guarantee Items available for online price matching? A: Walmart 1-Hour Guarantee items are not available for price matching. Q: Are Black Friday event items that are NOT 1-Hour Guarantee items available for online price matching? A: Yes, Black Friday in-store event items which are NOT 1-Hour Guarantee items are available for online price match if the items are identical. Walmart.com will not honor price matches for Walmart.com items between Thanksgiving and Cyber-Monday. Today we did a haul for $75 in product & got paid $.35 to take them home. An example from a few items we got, we used $1.50 off 2 axe deodorants MONEYMAKER, $2.00 off Tressemme $.94 a bottle & $1.00 Off Axe Shower Gel $.89 cents a bottle. You cant go wrong with prices like these! !